The Harley-Davidson® Softail Slim® S is a key part of the high-powered Harley-Davidson® S Series. 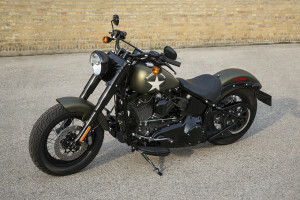 This new cruiser provides more power than the Softail Slim® thanks to a big engine upgrade, and it also shows off a bunch of distinctive styling tweaks for the new model year. If you want a bike that’s packed with attitude and pure Harley-Davidson® power, then this is the one for you. Find out more at Riverside Harley-Davidson®, your Inland Empire and Los Angeles, CA area Harley dealership. The Softail Slim® S features the infamous Screamin’ Eagle® Air Cooled Twin Cam 110B™. This engine ups the ante with more power and performance than the standard Slim®. 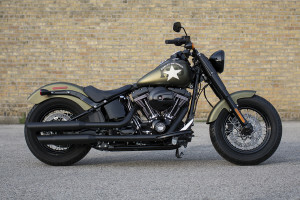 Screamin’ Eagle® Air-cooled, Twin Cam 110B™ Engine Power: The Screamin’ Eagle is one of the most powerful engines ever strapped to a Harley-Davidson® chassis, and it provides all the muscle you’ll ever need on the stripped down Softail Slim®. 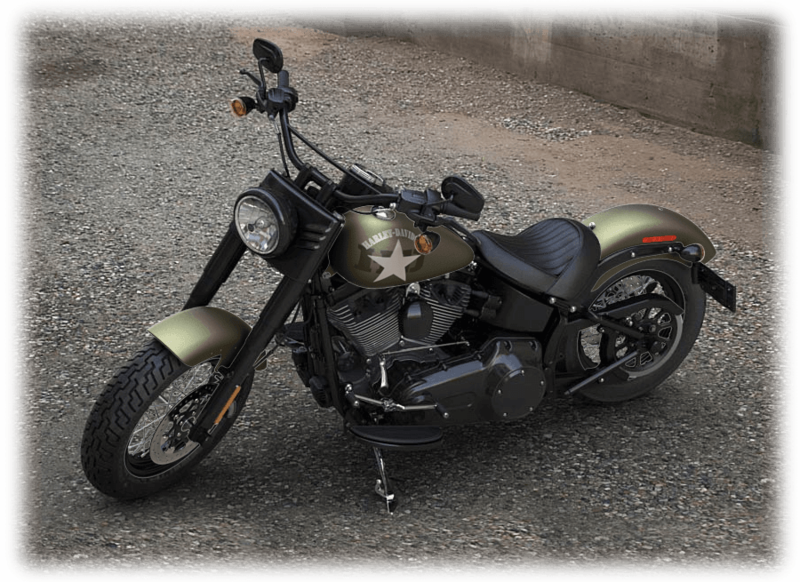 Screamin’ Eagle® Air-Cooled, Twin Cam 110B™ Engine Heritage: Descended from the famous Flathead, Panhead, and Shovelhead, the Screamin’ Eagle® delivers the kind of battle tested durability you expect from a Harley-Davidson® V-Twin. Screamin’ Eagle® Air-Cooled, Twin Cam 110B™ Engine Innovation: Counter-balancing allows this big V-Twin to provide awesome power with impressive refinement and smoothness at highway speeds. 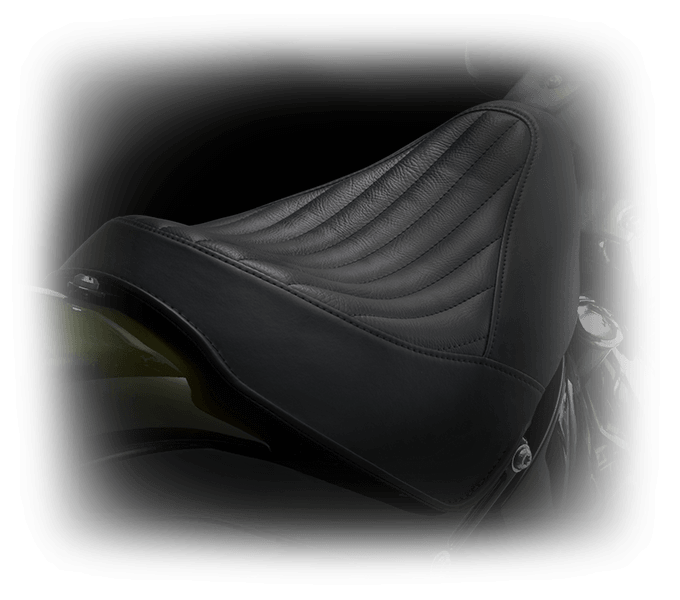 Screamin’ Eagle® Air-cooled, Twin Cam 110B™ Engine Style: The Screamin’® Eagle looks just as good as it sounds and runs. 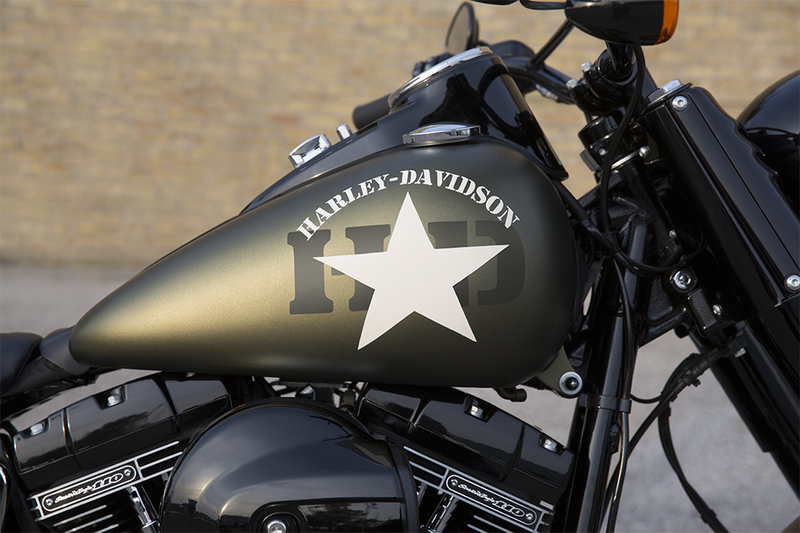 It features powdercoated cylinders, brilliant machined cooling fin tips, chrome rocker covers and heads, and custom badging. 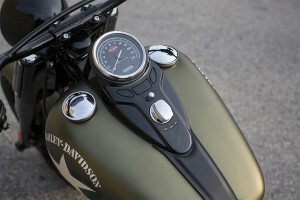 Six-Speed Cruise Drive® Transmission: You’ve got to have a solid gearbox to handle 110 cubic inches of V-Twin power. The Cruise Drive® provides smooth power delivery and easy shifting so you can take control of the Screamin’ Eagle® with ease. The Harley-Davidson® Softail Slim® S uses the same blend of classic bobber style and contemporary features that make the Slim® such a success. 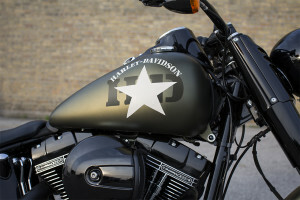 Custom Tank Graphics and Black Detailing: You can choose between Olive Gold Denim paint with a new military-inspired waterslide graphic, or Vivid Black Paint with a classic Harley-Davidson® Bar and Shield medallion. 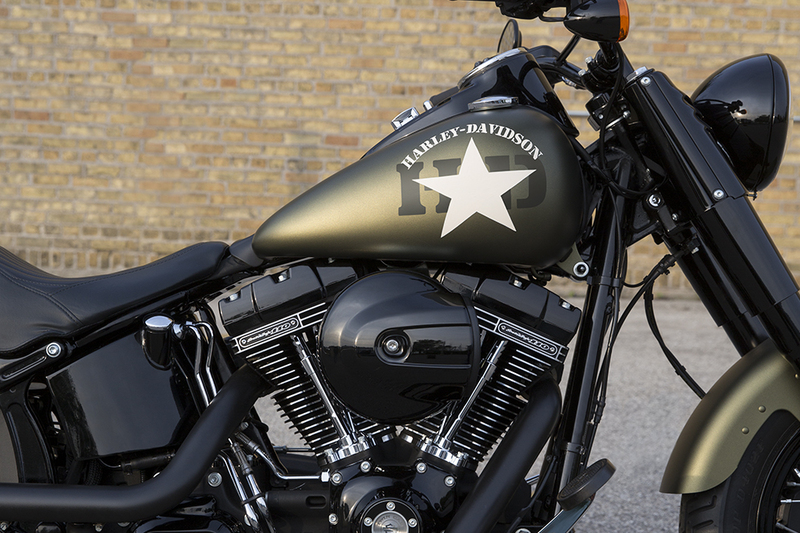 Stage 1 High Flow Round Air Intake: The Softail Slim® S comes with this oversized, gloss black, high flow air intake. It delivers all the air needed to the Screamin’ Eagle®. Blacked Out Exhaust: This bold 2-into-2 exhaust is all blacked out for a low-profile, all-custom look that sounds louder than it looks. 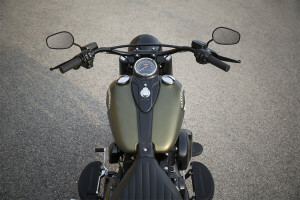 Narrow Rear Profile: The integrated stop/turn/tail light, minimal rear fender, and side-mounted license plate provide a sleek, simple rear end profile. 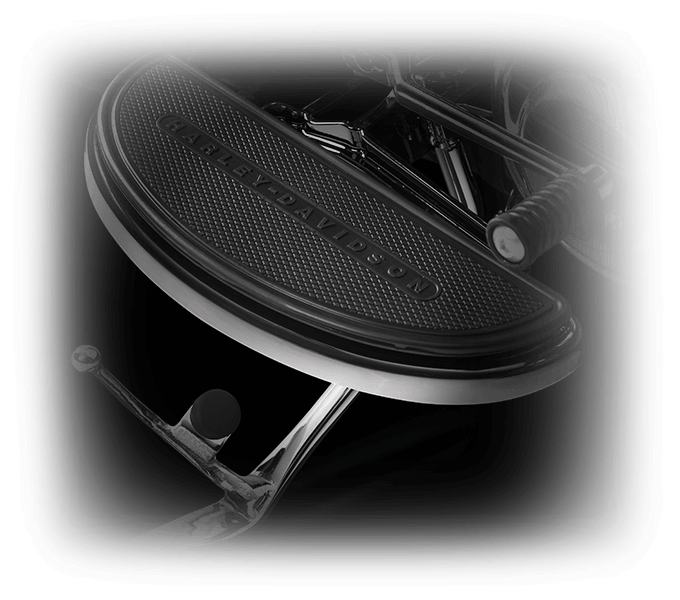 Hollywood Handlebars and Cat Eye Console: The Softail Slim® S gets these classic hollywood handlebars that provide plenty of sweep for a commanding riding position. The cat eye console holds all your gauges right where you want them. 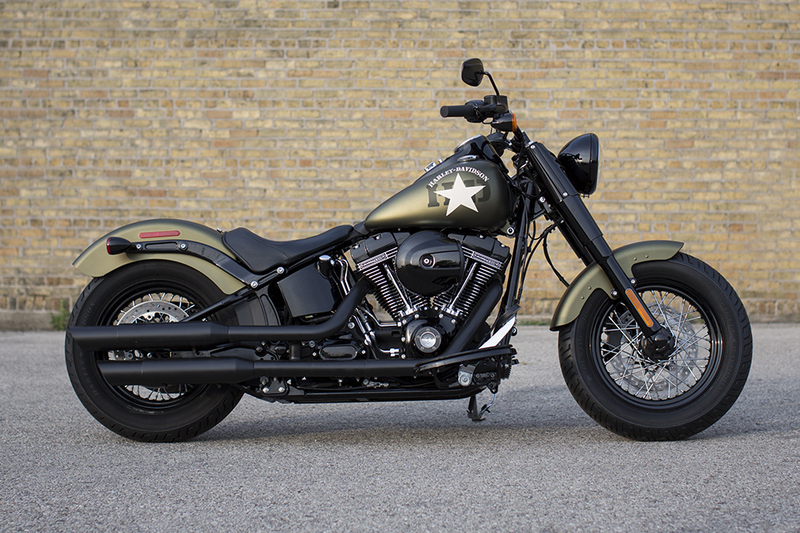 Hidden Rear Shocks: The Softail® line always comes with a slammed rigid bike look, but hidden suspension also provides plenty of comfort. 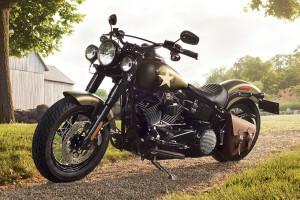 The Softail® Slim S might look like a throwback to simpler times, but it still provides the latest high tech features. H-D® Smart Security System: Every Softail Slim® S gets a wireless keyfob that automatically activates and deactivates the system when you leave and return. 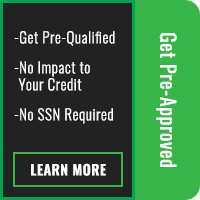 Anti-lock Brakes: You want to slow down just as fast as you speed up, and that’s where these powerful anti-lock brakes come in. 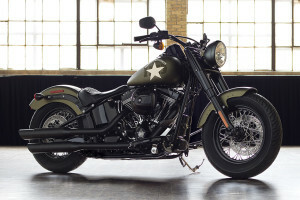 The Softail Slim® S delivers impressive handling performance along with smart features and design. Front Brake System: You’ve got bigger 300mm rotors as well as 32mm and 34mm pistons. They deliver more braking force with less lever pull. 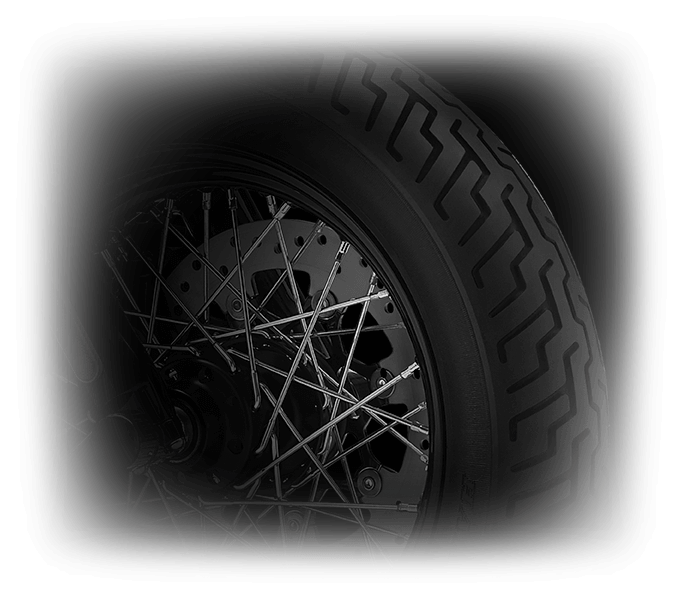 Dunlop® Tires: With a three-ply polyester casing and two fiberglass belts, these premium Dunlop® tires provide impressive grip and long-lasting durability. 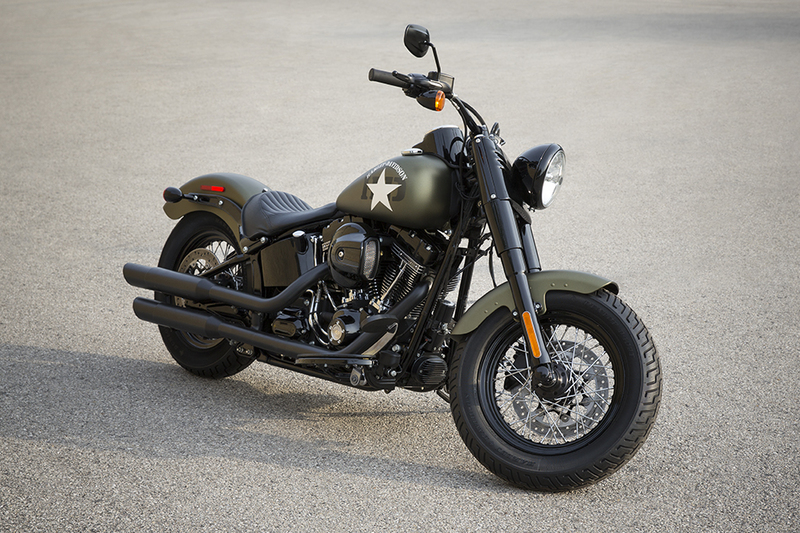 Engineered for Easy Handling: The Softail Slim® S motorcycle features nimble, confident handling thanks to smart front end geometry and a low center of gravity. 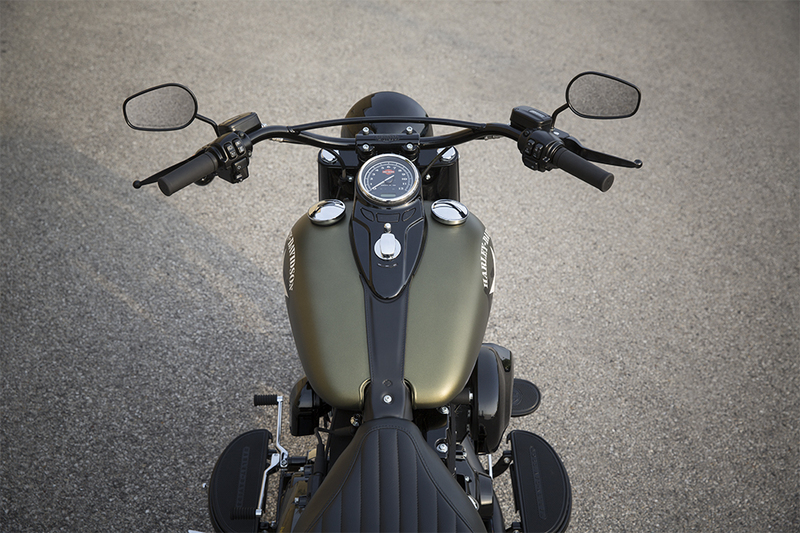 New Ergonomically Designed Hand Controls: The Softail Slim® S has ergonomically designed hand controls that keep you comfortable and in control when riding. 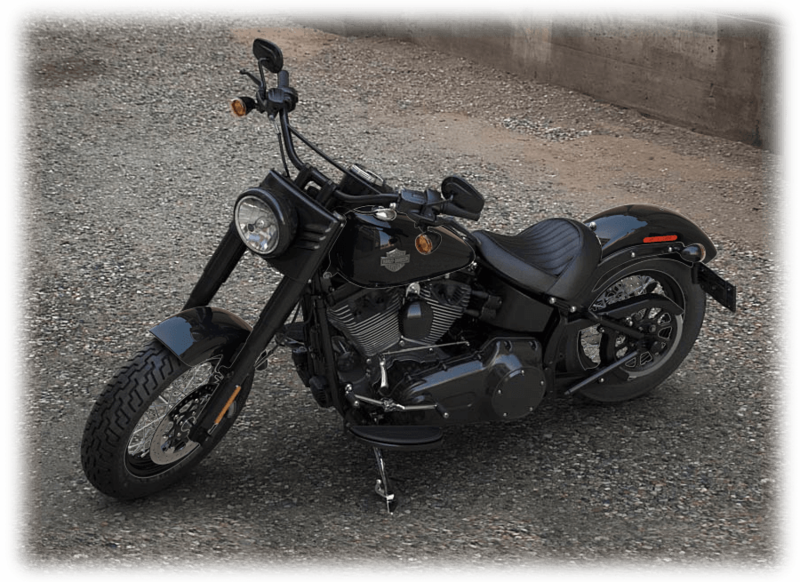 New Electronic Throttle Control and Cruise Control: For a clean, simple setup, the Softail Slim® S gets electronic throttle control with internal wiring and standard cruise control. This makes it easy to eat up mile after mile on the highway. The Softail Slim® S is all business, but it also delivers the comfort you want for longer rides. Half Moon Foot Boards: These smart foot boards provide a comfortable place to put your boots. 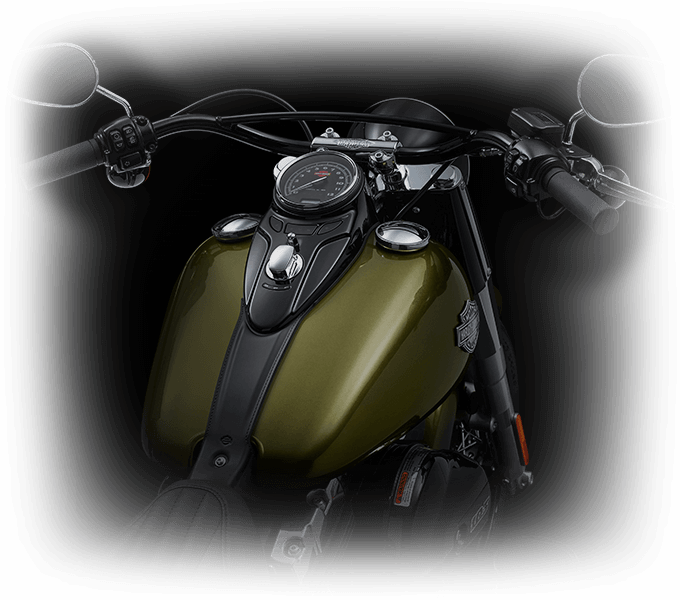 Their fresh twist on a classic design features chrome-plated steel surrounds and high durability, raised-rubber shapes. Low Solo Seat: This low slung seat provides a deep bucket and a narrow neck for all-day comfort. It offers the perfect, in-command position for tackling anything the road throws at you.